Tezos is a self-amending cryptographic ledger which can evolve and be amended through an on-chain, formal community governance process. Though hard forks are still possible, since the code is open source and anyone can fork the code, the established, well-practiced governance process offers everyone a fair, uniform way to make changes, and legitimize those changes by direct community voting. This formalism should present such a clear, easy way to change the protocol that the community is unlikely to govern by factional fighting, social splits, and cults of personality. Even if the discussion itself is heated and contentious, in the end, everyone respects the outcome of the process. A dev team injects the hash of a tarball file as a proposal into the Tezos Protocol with an invoice attached. The injected proposal goes through 4 phases. The first phase, known as the initial voting period, is where bakers will vote and decide if the proposal is best for the protocol. There can be a maximum of 20 proposals per baker in this phase. The second phase, known as the exploration voting period, is where another vote is made to move forward. During this phase, 80% Quorum is needed to vote “Yay” and proceed with a testing period of the proposed changes. The Quorum adjusts accordingly and won’t always 80%. This phase also requires to meet super majority to proceed. The third phase, known as the testing phase, is where a temporary blockchain is formed for testing purposes. If things run smoothly and there are no significant problems, a final promotional period will begin. The final phase, known as the promotional period, is where a final vote is cast on the proposed changes. During this final phase, if voted through, the new protocol will be added automatically with the new code and the protocol mints the tokens attached as an invoice in the proposal. If it does not go through, it goes back to the proposal phase. The process can take up to roughly, 3 months. This entire process is broken down here, for reference. But, what makes this governance process unique, not only does it drive stability and security to the Tezos protocol, but it allows Tezos to amend any blockchain feature and always stay up to date without having to hard-fork or split the network. Tezos has not been shy of making great strides this quarter. Apart from climbing up the market cap, while quietly building away, this trend is likely going to keep continuing. On February 11, 2019, it was announced that Elevated Returns and Securitize will tokenize $1 billion worth of real assets on Tezos. 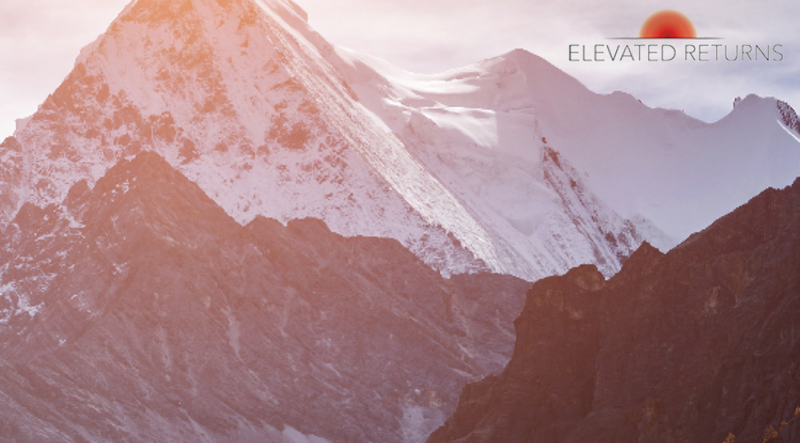 Elevated Returns is already a leader in security token issuance and the STO market. In the past, Elevated Returns tokenized about 18.9% of the St. Regis Aspen resort hotel, through $18 million raised in digital tokens on the Ethereum blockchain. Considering this, Stephane De Baets, who is the President and Founder of Elevated Returns, considers Tezos a much more suitable alternative. As reported by Christine Kim of Coindesk, Tezos first proposed protocol amendment dubbed “Athens A” was passed through the initial voting period. Tezos Athens, as originally proposed by Nomadic Labs on February 25, 2019, had two separate proposals voters were expected to vote on. The proposal dubbed “Athens A”, won a majority of votes from bakers obtaining 18,181 votes out of the 25,855 community votes placed. The Tezos Foundation, which holds roughly 1/3 voting power, decided to remain neutral on the vote. “We are excited to see the first active Proposal Period nearing completion. As communicated near the beginning of the Proposal Period, the Tezos Foundation decided to remain neutral by not upvoting any proposals”. An increase in the gas limit. A reduction in baking roll sizes. Regarding the first point, initially, the gas limit was set with the idea and notion that it could be changed later on through the amendment process. With this proposal, the number of IO’s performed in each block will remain unchanged, while increasing the gas limit. On the second point, currently, bakers wishing to facilitate consensus and vote on governance proposals must have 10,000 XTZ. This number is calculated and coined as the term known as a “roll”. This proposal seeks to reduce roll sizes to 8,000 XTZ, reducing the minimum baking threshold and lowering the barrier of entry for prospective bakers wishing to facilitate consensus. As of this date, Tezos has 4 days left in the exploration voting period, which is roughly a 3-week process. Over 86% of the needed 80% quorum has already been reached, showing participation within governance is very active and people are eager to grow and contribute to the ecosystem. As initially announced on Coinbase’s blog, Coinbase Custody will begin allowing baking to come to Coinbase Custody’s clients. Coinbase Custody is the first “full-service, regulated, comprehensively-insured, and 100% offline staking provider in crypto”. Furthermore, Coinbase Custody has more than 60 clients and roughly $600 million in assets under custody. With Tezos becoming the first asset listed to Coinbase Custody’s new staking service, it shows great trust and optimism from an industry leader in the Tezos Protocol. “Thank you @breitwoman and @tezos team for being an innovator in crypto governance, and having such tenacity/determination/true grit. Hallmark of a great entrepreneur”. In addition to baking coming to Coinbase Custody for Tezos, voting is coming in Q2–2019, pending approval per Coinbase’s internal evaluation process. 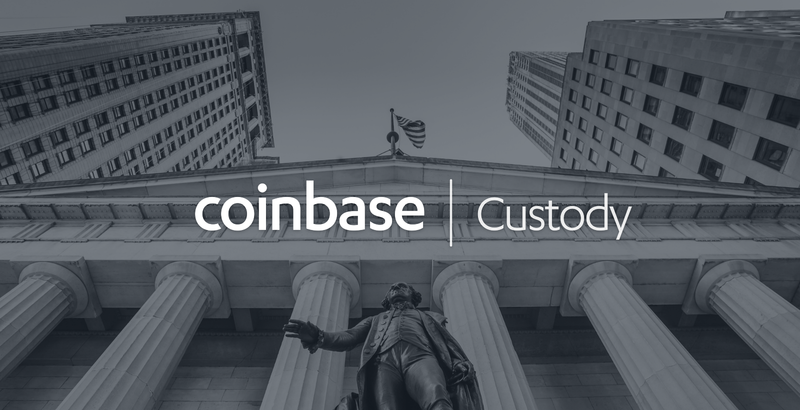 In Q2-2019, Coinbase Custody clients will be able to vote on protocol amendments and facilitate consensus on the Tezos Protocol, through actively participating in governance. Perhaps one of the most under the radar aspects to the Tezos governance structure, inflation funding, is a new concept in blockchain. So many people get the idea and think inflation is bad, but depending on how it’s executed, it can incentivize people to perform certain things. However, Spencer Noon goes into great depth on this new concept unique to Tezos. Essentially, Tezos’ governance structure allows a dev team to attach an invoice to their proposed protocol amendment, a unique on-chain method of funding the development of protocol proposals. Notice that this process is open and permissionless. There is no central authority to censor or “evaluate” what gets proposed; there is no behind the scenes negotiation and a junta of the “bigs” that determines who gets rewarded and what gets done. It is transparent; it is open; it devolves decision making powers to the token holders. In this sense, the token holders are the owners, operators, and governors of the network. This kind of considered formalism is something like Athenian democracy versus Spartan feudalism. The idea of “submit your invoice” also shows a respect for independent spirit and creativity, because the common “Wealth of Nations” comes out of human genius and should be rewarded. 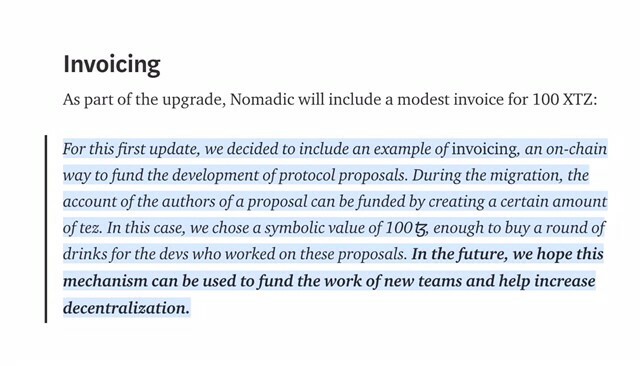 Considering this, as we saw with the Athens proposals, Nomadic Labs attached an invoice for 100 XTZ to each Athens proposal so the team could buy a round of drinks, providing an example of invoicing. This example of invoicing provides the framework for a new blockchain funding mechanism. Furthermore, inflation funding can have the capability and lead to several implications against open source funding and pave the way for teams to begin working for public blockchains, as opposed to private companies. There are multiple proposals coming forward in the next few months following the historic, Athens proposal. Simply put, zk-SNARKs, or “Zero-Knowledge Succinct Non-Interactive Argument of Knowledge”, enable one to prove possession of certain information, without divulging that information and having any interaction between the prover and verifier. Essentially, two parties can prove whether certain information is true without revealing any information except for the accuracy of the statement itself. According to Benjamin Canou, CTO of Nomadic Labs, integration of zero-knowledge cryptography like zk-SNARKs, is expected to be voted on in the coming months. The Tezos Foundation announced recently, on March 27, 2019, that Cryptium Labs received a grant “to develop baking and consensus improvements that may be implemented to the Tezos core protocol”. Additionally, the blog post hinted at how Cryptium Labs “will also collaborate with Nomadic Labs on various initiatives regarding the Tezos core protocol and other development efforts”. “The Cryptium Labs team is already working with Nomadic and others on a variant of Tendermint consensus, a mechanism inspired by classical BFT research in distributed systems, to add finality to Tezos”. The Cryptium Labs team is led by Adrian Brink, Awa Sun Yin, and Christopher Goes. All the team members apart of Cryptium Labs have extensive experience as protocol researchers and engineers. They have been notably involved with not only Tezos but, Cosmos, Tendermint Core, and Polkadot as well. Initially announced on April 1, 2019, by Cryptium Labs, the Burebrot Protocol Upgrade seeks to improve the current Tezos account system. Additionally, the protocol upgrade seeks to improve existing services for bakers. These are included but not limited to, enforcing self-bond requirements, implementation, and offering of additional products for bakers such as derivatives or options, and overall improvements on security and usability of proof-of-stake (PoS). 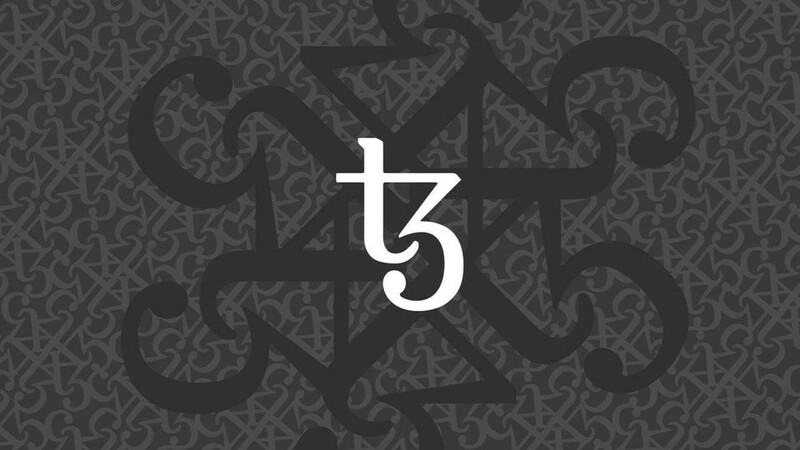 Tezos has kickstarted 2019 in full force, securing a great position in the growing STO market, becoming the very first asset listed on Coinbase Custody’s new staking service, and having widespread participation in governance from the get-go. Additionally, the Tezos Foundation has announced it’s 2017 statutory audit from one of the “Big Four” accounting firms, PricewaterhouseCoopers, has been completed, showing the financial state of Tezos is strong and thriving, even in the bear market.